We relocated from Johannesburg to Durban in 2000 when Hylton was 10 years old. He went to school at Sunfield Canelands. His teacher saw great potential in Hylton’s swimming and he started officially having swimming lessons in 2000. From a small baby Hylton loved the water. Hylton swam his first World Down Syndrome championships in 2004 which were held in Durban, South Africa. 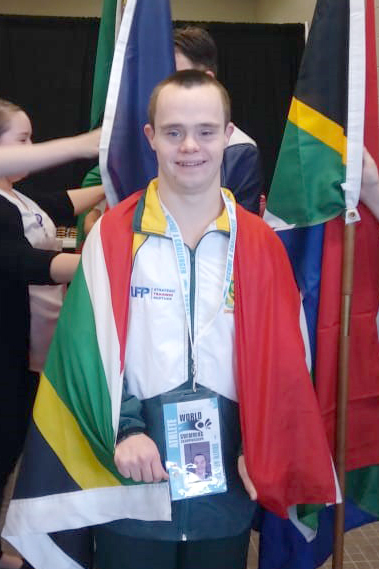 He has now represented South Africa in 8 World Down Syndrome Championship around the world. Hylton currently holds 6 Open South African records (includes short and long course) as well as South African Master records. He is a good “all round” swimmer. His favourite strokes are breast and butterfly. At the World Champs in Italy in 2016 and Canada 2018 he won a bronze medal in 50m Breaststroke. Hylton is one of the anchor members of the men’s relay team, helping South Africa to win medals. Hylton has been the recipient of the Top Male swimmer at the SASA-II National games on several occasions as well as in KZN province. He was also nominated for the prestigious KZN Premier Awards in 2016.